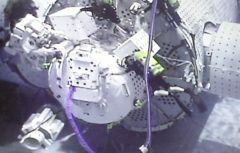 July 18, 2017 – The NanoRacks Airlock Module design continues to mature as NASA’s Johnson Space Center successfully ran testing on a NASA-built full-scale mockup of the Airlock in their Neutral Buoyancy Laboratory (NBL). NanoRacks LLC was formed in 2009 to provide commercial hardware and services for the U.S. National Laboratory onboard the International Space Station via a Space Act Agreement with NASA. In July 2015, NanoRacks signed a teaming agreement with Blue Origin to offer integration services on their New Shepard space vehicle. NanoRacks, along with partners at ULA and Space Systems Loral was also recently selected by NASA to participate in the NextSTEPs Phase II program to develop commercial habitation systems in low-Earth orbit and beyond.